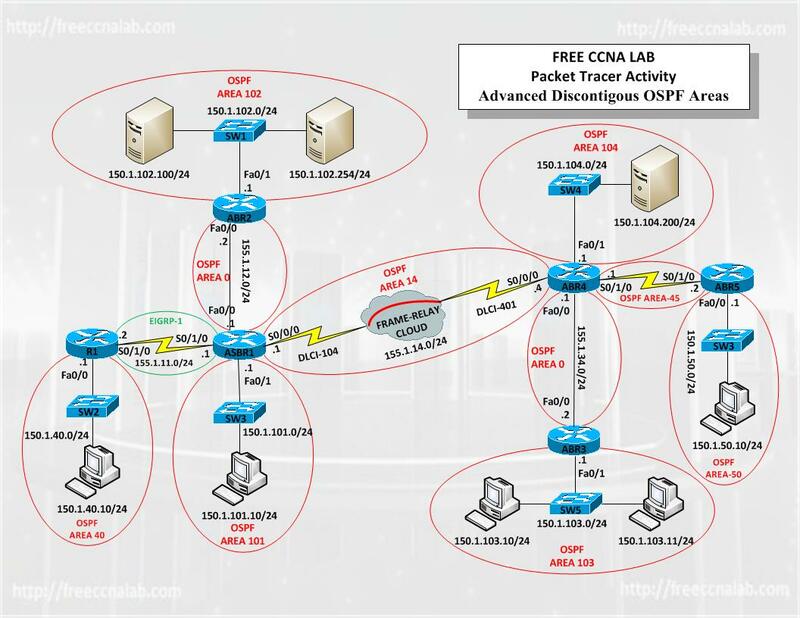 In this free CCNA lab we will use Packet Tracer to learn how to configure Open Shortest Path First (OSPF) routing protocol to connect multiple discontigous areas. As you can see from the network diagram we have two OSPF areas that are not directly connected to OSPF backbone area 0. There is also a discontinuity between two OSPF backbone areas. Understand and configure virtual links. Configure tunnels to connect OSPF areas. In the OSPF routing protocol all areas in an autonomous system must be physically connected to the backbone area (Area 0). In some cases, where this is not possible, you can use one of two methods to connect to the backbone through a non-backbone area known as a transit area, a virtual link, or a tunnel. Each of these methods has pluses and minuses. The most common and straightforward is to use a virtual-link. This area is known as a transit area, and must have full routing information; also it cannot be a stub area. This method is most commonly used to connect sub areas to the backbone area. The second method is use a GRE tunnel to pass the OSPF routing information through. The tunnel method dose add overhead as it requires encrypting the data and adding header information to the packets being passed, although an advantage is the it can go through a stub area. This method is very useful when connecting discontigous OSPF backbone areas. Although I have created this lab using Packet Tracer I have included a network diagram so the lab can be completed using GNS3 or real hardware. I have also provided two solution configuration files one using all virtual links and the other using a tunnel to connect the two OSPF backbone areas. Configure router hostnames on all routers. Configure IP addresses on Fast Ethernet interfaces of all routers as shown on the network diagram. Configure IP addresses on Serial interfaces of all routers as shown on the network diagram. Configure frame relay on serial interface S0/0/0 of ASBR1 and ABR4 as shown on the network diagram. Configure all routers to be part of the OSPF routing process 100. Configure routers ASBR1 and ABR4 to advertise network 155.1.14.0/24 as OSPF area 14. Configure routers ASBR1 and ABR2 to advertise network 155.1.12.0/24 as OSPF area 0. Configure routers ABR3 and ABR4 to advertise network 155.1.34.0/24 as OSPF area 0. Configure routers ABR4 and ABR5 to advertise network 155.1.45.0/24 as OSPF area 45. Advertise network 150.1.40.0/24 as OSPF area 40. Advertise network 150.1.50.0/24 as OSPF area 50. Advertise network 150.1.101.0/24 as OSPF area 101. Advertise network 150.1.102.0/24 as OSPF area 102. Advertise network 150.1.103.0/24 as OSPF area 103. Advertise network 150.1.104.0/24 as OSPF area 104. Configure area 45 as a virtual link. Repair the discontigous OSPF backbone area 0. Configure R1 and ASBR1 to be part of the EIGRP routing protocol in AS-1. Configure the network 155.1.11.0/24 to be part of the EIGRP routing protocol AS-1. Redistribute EIGRP routes into OSPF. Redistribute OSPF routes into EIGRP. Verify full connectivity from and to all end devices.